Thank you so much to Harper Collins Australia for sending me a review copy of A Lady’s Guide to Petticoats and Piracy by Mackenzi Lee. The copy arrived after I had finished the book so I can promise you that receiving a copy in no way impacted my thoughts, feelings or rating of this book. A Lady’s Guide to Petticoats and Piracy was one of my most anticipated books of 2018. I was a massive fan of A Gentlemen’s Guide to Vice and Virtue and adored Felicity as a side character throughout. I am not sure if it was my expectations, the way I consumed this book or simply because this wasn’t as good as the first that led to my utter disappointment. Some series are just not meant to be a duology, and this was one of them. Mackenzi Lee perfectly captured the voice of Monty in her first book but Felicity felt one-dimensional and was beyond frustrating. 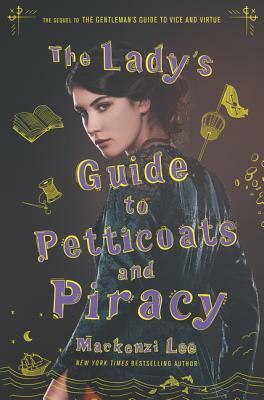 A Lady’s Guide to Petticoats and Piracy follows Felicity as she sets herself up to attend medical school and become a doctor – something that is unfamiliar in this Victorian-era set book. So unfamiliar that she is laughed at several times. So when an opportunity comes for her to meet her medical idol, she takes it. Even if it means seeing a friend who had treated her terribly. Felicity can act. Or so she thinks. To take this journey Felicity gets help from a young Muslim female pirate, Sim, which leads to the pair impersonating a lady and maid across Europe as they travel to Germany. There are several important conversations throughout A Lady’s Guide to Petticoats and Piracy, mainly about colonialism and the standards of women in this era. Felicity is an ace-aro woman but for some reason, she seems to so desperately think that she is not like anyone else that is frustrating. Not in terms of her sexuality. No, in terms of the fact that she wants a medical degree. So much of the book is focused on this so when it does a complete 180 around halfway into this book I was stunned. I personally wouldn’t say that Felicity goes through any type of character arc throughout this book. She seems to realise that she was acting unkind towards others but does nothing to fix her behaviours. I am someone who adores unlikeable characters but Felicity was too much for me – especially since I think I was meant to like her. Every other character felt quite bland to me, honestly. I was yawning and ready to shut down the audiobook. The only reason I powered through was that I was on the train up to Brisbane and couldn’t be bothered to find my phone. The lack of personality in each character was so clear to me, it really felt like everyone was just pushing Felicity’s story along – which is kind of useless to me, since her story wasn’t even that spectacular. My favourite part of the book had to the inclusions with Monty and Percy – they only made small snippets but it was worth it. When they first appear Percy is recovering from a seizure and the way he was described, even though it was a few days after the fit, was incredibly real for me as someone with an epileptic mother. Oh, this story also had dragons. Something that was incredibly random and I am still confused about but it was fabulous. So, basically, what this story lacked in piracy (because we are promised piracy in the title) it made up for with dragons. It was also good to see female friendships, this book had a nice trio that followed throughout. I can’t say too much on it since I did mention earlier that all these characters felt bland. Overall, A Lady’s Guide to Petticoats and Piracy was incredibly lacklustre. It lacked the depth and spark that the first book in the series did for me which was incredibly disappointing. I expected more, which may have been why I was not blown away by it at all. I tried not to touch on any of the diversity that is throughout this book since I don’t feel I am educated enough to do so, but Chiara @ Delicate Eternity wrote a fantastic review that talks more about these things. You can find that here.